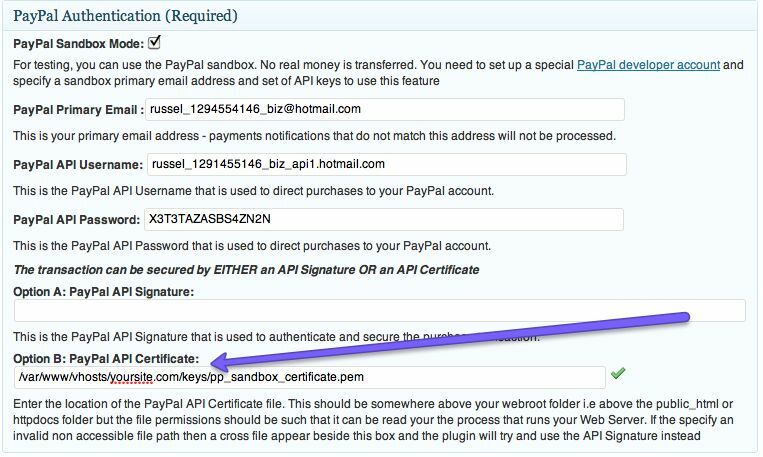 With the PayPal API there are two methods of authentication: an API Signature and API Certificate. Up until SubscriptionBoss version 0.98 only the API signature was supported but with the release of version 0.99 you have the ability to authenticate PayPal API transactions using an API Certificate. For most users using a signature is the simpler option however for PayFlow Pro users which already have a API certificate then this is the preferred option. PayPal has some instructions on requesting a certificate including screenshots. FTP the certificate on to your web server and place it in a folder above the webroot of the site. So, for example, if the webroot is /var/www/vhosts/yoursite.com/httpdocs/ , then place the file in /var/www/vhosts/yoursite.com/. Click on Save. If it finds the file then a green tick will appear alongside the field; if it cannot find the file then a red cross will appear. If you change from using an API Signature to using an API Certificate then remember that while the API Username for the certificate will probably be the same as for the API Username for the Signature, the API Password will be different. If the password is wrong then the user will be sent to the SubscriptionBoss error page which displays a PayPal error message: Authentication/Authorization Failed (10002) message. So therefore make sure that the PayPal API Password on SubscriptionBoss matches the password that appears on the page on PayPal where you can download the certificate.